Homewhat is facebook lite? facebook liteWhat is the difference between Facebook and Facebook Lite? 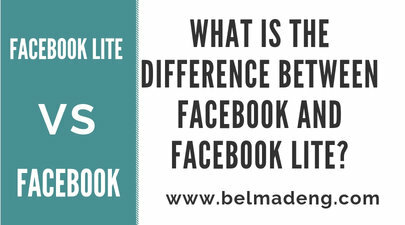 What is the difference between Facebook and Facebook Lite? A friend of my mine asked me the question that makes the title of this article. To proffer a concise answer to it, I've decided to compile this article. So if you're looking for the difference between Facebook and Facebook Lite, this post got you covered. Here are the differences between it and the original Facebook app. See: How do I find a Facebook profile with only a picture? Facebook Lite is an Android app created for low-speed connections and low spec phones. Facebook’s main app weighs in at 57 MB on my Motorola Moto E4; Facebook Lite is a mere 1.59 MB—that’s about 96.5% less space. Facebook Lite is designed to use less RAM and CPU power, as well, so you’ll get a smoother experience on cheaper and less powerful phones. Facebook Lite also works on older phones that are no longer supported by the regular app. If you wish to check it out, you can download Facebook Lite from the Play store. In addition to using fewer system resources, Facebook Lite is really customized to work on slow or unstable internet connections like 2G networks or in rural areas with a poor signal. To do this, it uses a lot fewer data by not downloading high-resolution images or autoplaying videos. This has the added bonus of saving you money if you’re on a metered plan. Interestingly, Facebook Lite is almost as fully featured as the general Facebook app. You can also like and comment on your friend’s posts, visit their profiles, post to your own Timeline, and do everything else you normally do. Even with all the features present, the difference you’ll notice with Facebook Lite is the totally stripped down interface with bigger, blockier buttons and other elements. It feels pretty dated, but it is functional. On phones with smaller screens, the larger UI elements are definitely a plus.